I certainly can’t take credit for this amazing idea. But its a wonderful addition to getting your noisy lady the “greens” that she needs and wants to feel content and purpose-filled every morning. When she wakes up, emerges from her coop and stretches her wings and legs the first thing she may want to see is a field of greens. 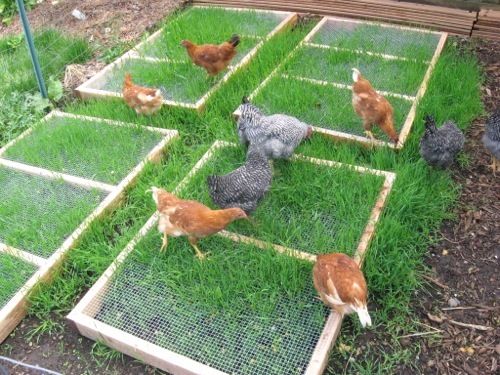 Make this happen with this incredible idea of a greens grazer that will prevent your chicken from eliminating all life in her chicken run. This is simple: some sturdy utility mesh nailed to 4ftx6inch pieces of untreated lumbar crafted into a square or rectangle. Plant seed of some luscious greens underneath the mesh to protect the seeds, seedlings, and grass from over grazing which you know your hens will do if given half the chance.